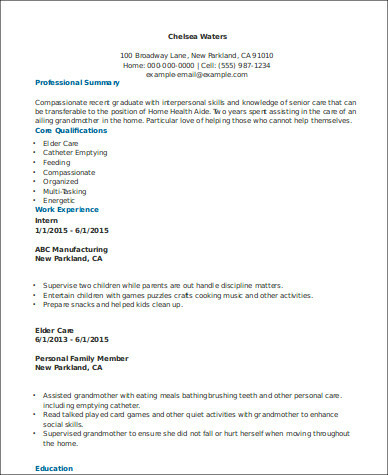 Being one among many candidates for a home health aide position—one that you have always wanted—can be tough. You will need to make it your goal to stand out from other applicants. Doing so involves preparing and organizing your credentials in a manner that will intrigue a prospective employer. 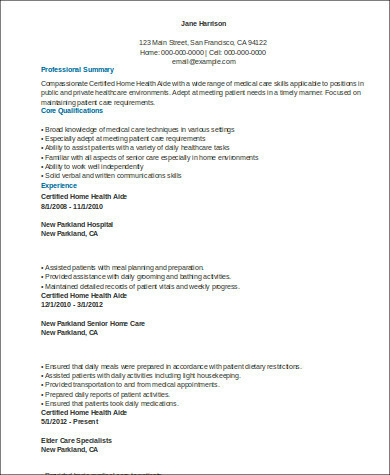 The type of resume you will be writing for a home health aide position is a targeted resume. 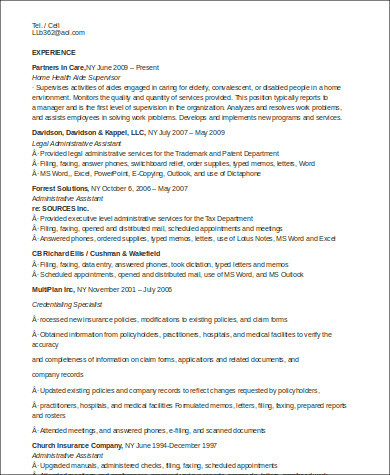 You can look through the Sample Resumes seen on this page to get a good glimpse of the format and contents of such a document. Surely you will be able to write a resume that will pique the interest of the person bound to read it. 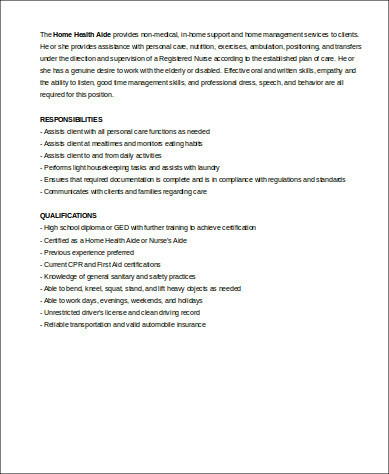 An impressive and effective targeted resume is comprised of several components. 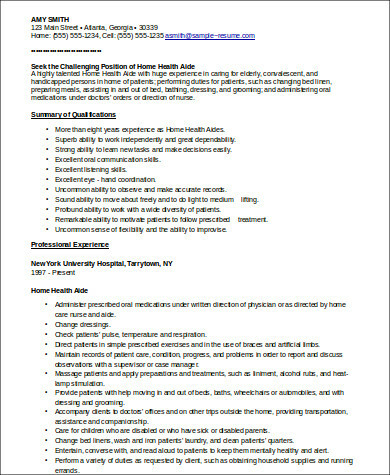 To increase your chances of getting hired as a home health aide, it is essential that you are able to produce a well-written resume that contains such components. It helps to take a look at Sample Resumes in Word or some of the Best Sample Resumes / CV to have a useful reference for when you put together your own resume. It is always best to take your time when it comes to preparing your credentials. Doing so will allow you to focus on how you can organize them, as well as present them. Bear in mind that how you present your credentials is just as important as its contents. When it comes to content, you can take a step-by-step approach in writing it. A targeted resume usually begins with a summary statement. 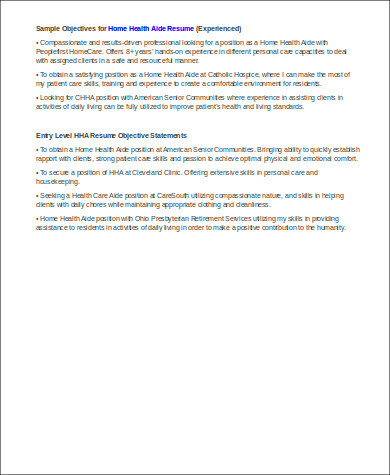 A summary statement is a brief overview of yourself as a potential home health aide applicant. Because this part is the first thing a prospective employer reads, you will need to make it eye-catching. After your summary statement, your next focus is citing your work experience. In a targeted resume, you must only include information that holds tremendous relevance to the position being applied for. Hence, in this case, since you are applying to be a home health aide, you should only cite work (both paid and voluntary) that is in relation to such a position. 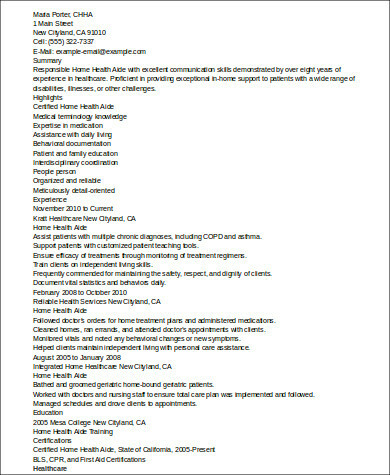 If you previously worked as a nursing assistant or an all-around aide in a geriatric care facility, you can mention that in your resume. Much like the Sample Nurse Resumes you can take a look at in other articles, you will also need to enumerate the practical skills you have that will be useful to the tasks involved in being a home health aide. Some skills you may need to have to be a home health aide are active listening skills, ability to promptly attend to a patient’s needs, basic health care (e.g. 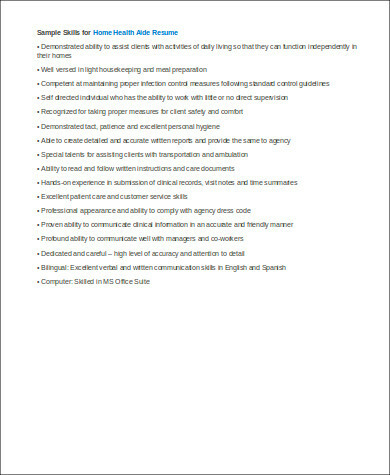 ability to efficiently monitor a patient’s condition), and housekeeping. The final part of your resume is where you will state your character references. List down the people who previously employed you and also those whom you worked with. Your character references are those who will vouch for you should your prospective employer need to verify certain information.